SYBARITE5 "Classically trained to rock your f*%# ing socks off"
Brought to you by National Repertory Orchestra, Billboard chart-topping quintet SYBARITE5 plays one night only at the Silverthorne Pavillion (NO LONGER AT THE RIVERWALK CENTER). “Their rock star status…is well deserved. Their classically honed technique mixed with grit and all out passionate attack transfixes the audience…” That is how the Sarasota Herald Tribune described SYBARITE5. 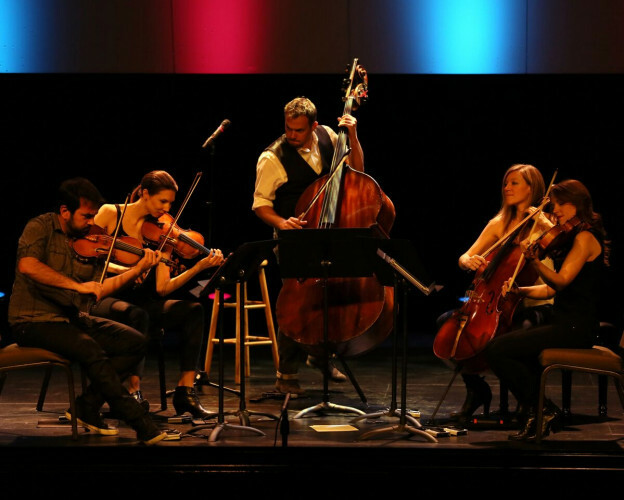 From the moment their bows hit the strings, this quintet of talented, diverse musicians takes the audience on an exciting ride that engages the senses and redefines the rules. Dubbed the “Millennial Kronos,” SYBARITE5’s eclectic repertoire from Bowie to Radiohead and Akiho to Assad combined with its commanding performance style is turning heads throughout the music world.